Romania has won two medals at the European Shooting Championship 10 metres in Osijek, Croatia, gold medal won by Laura Coman and bronze medal by the Air Rifle Women’s team. 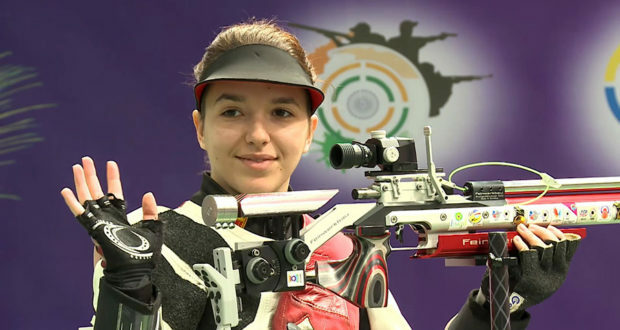 Laura Coman (photo) won the gold medal in the 10 metres air rifle, after two rounds of playoff. Coman had 249.1 points, followed by Nina Christen (Switzerland) 249.1 points and Franziska Peer (Austria) 228.3 points. The Air Rifle Women’s team of Romania included Laura Coman, Eliza Molnar and Roxana Sidfi and won the bronze medal in the 10 metres event, defeating Austria in the dispute for the 3rd position. Russia won the gold medal and Italy took the silver. Alin Moldoveanu, Olympic champion in 2012 at the air rifle event was 22nd and failed to qualify in the final.